"Blue Marble Zippered Check Cover" product is already in your cart. 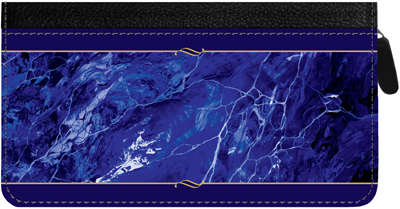 This Designer Zippered Checkbook Cover can carry your personal checks, money, credit cards and ID. Zips close to keep everything inside. On the inside of the cover there are 4 slots for holding your credit cards, a pen holder, and a windowed slot to hold your identification card. Also there are 2 pockets behind the slots to hold money and your register; as well as a plastic protector for use with duplicate checks. On the back side is a zippered pocket to keep change, receipts or non essential papers. As always, these covers are available at our everyday low prices.